In recent years, mass shootings and other forms of gun violence have dominated the American news cycle. happylucky no.1 has always been place for the arts, but it also has always been their mission to be a welcoming space in the Crown Heights neighborhood. They decided to team up with SOS – Neighbors in Action because they have been crucial in mitigating violence by offering mediation, legal advocacy, and guidance to people in Crown Heights. In an ideal world, gun reform would help aid this particular strain of violence, and it is a cause that needs all of our support. However, SOS has still managed to decrease violence dramatically in our neighborhood and became a model for crime prevention across all five boroughs of New York City. happylucky no.1 decided to take a fun and positive approach to this cause by hosting an exhibition and throwing a party. Join them for a night of great company, delicious food and drinks all to benefit SOS and Crown Heights. 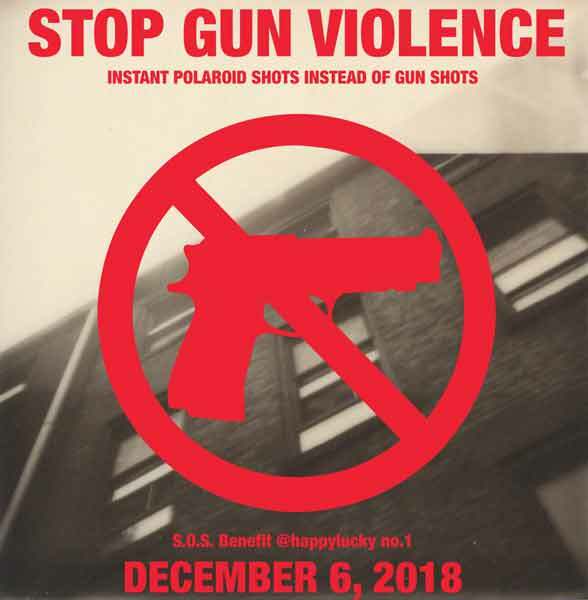 This event is a part of Instant Satisfaction, an exhibition of Polaroid prints, with sales that will also go directly to SOS. Please help them make a difference right there in Crown Heights, and support art to help end gun violence!